I took a little walk in Retiro Park near the Fallen Angel statue. 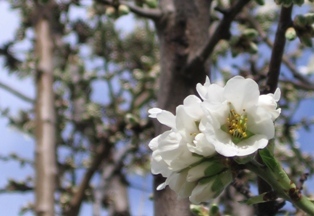 Some almond trees in the grove nearby were in bloom, some had finished flowering, some were still waiting. Usually they bloom in unison. A few bees visited the blossoms, but not enough to pollinate them all. Magpies were building nests, but the European blackbirds (like American robins, but all black) were silent. This has been a record-breaking warm and dry winter, but we just had a frigid, wet spell – seasonal weather, but late. Is it spring yet? Or is it finally winter? Those who ought to know, the birds and bees and trees, can’t give me a clear answer.